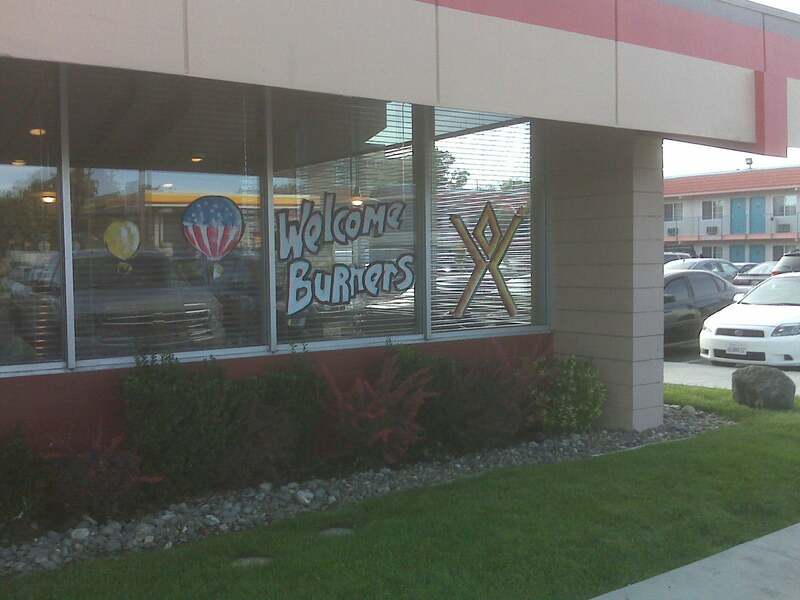 Does your hometown have any mathematical tourist attractions such as statues, plaques, graves, the cafe where the famous conjecture was made, the desk where the famous initials are scratched, birthplaces, houses, or memorials? Have you encountered a mathematical sight on your travels? If so, we invite you to submit an essay to this column. Be sure to include a picture, a description of its mathematical significance, and either a map or directions so that others may follow in your tracks. A math degree can take you to a lot of places, both physically and figuratively, and if you play your cards right, you too can argue counterfactual definiteness with a shaman. 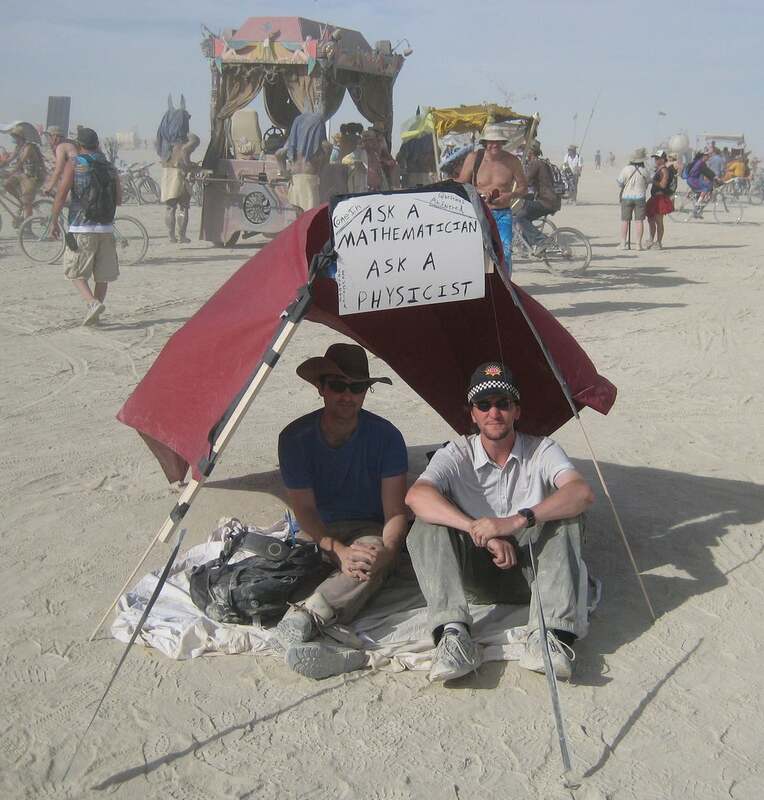 First in 2008, and several times since, a fellow math PhD and I traveled to the Burning Man art festival to sit in the desert and talk with the locals about whatever they happened to be curious about. Burning Man began in 1986, when a group of people (who would argue endlessly over any finite list of their names) decided to assemble annually on a San Francisco beach and burn a wooden human effigy. 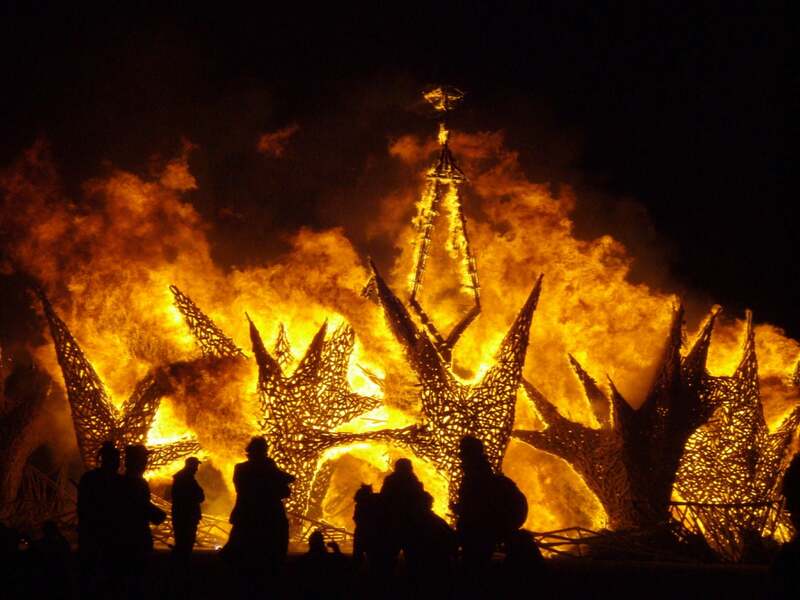 In 1990, increasing membership and a lack of fire permits forced Burning Man to combine with Zone #4, a ‘‘Dadaist temporary autonomous zone’’ piloted by the Cacophony Society, in the Black Rock Desert, 110 miles outside of Reno, Nevada. As of 2017, the festival has expanded to a modest 70,000 people. For the week it exists, Black Rock City (the name for the physical infrastructure of the festival) is the sixth largest city in Nevada. At first blush, it may seem a little audacious to call a festival a ‘‘city,’’ but by most definitions of the word, Black Rock City qualifies, supplying sanitation, roads, lighting (by the Lamplighter’s Guild), police, emergency services (including fire, of course), and even a Department of Mutant Vehicles. The Black Rock Desert is ideal for fire-based art. As an alkali flat, there is nothing to burn and nothing to break. The ground is a flat expanse of white powder, reverently monikered the ‘‘Playa.’’ It is a rare moment of relief that you’re not aware of the dust on everything and everyone. The Playa is simultaneously a blank canvas for sculpture and a stunning panorama, and being completely fireproof gives artists a little more leeway than they might have in the Guggenheim. The same blank slate applies to Black Rock City as a whole. Not constrained by physical impediments, like being in a convention center or civilization in general, Black Rock City is free to follow mathematical ideals of organization. Most cities are roughly arranged on grids, but obstructed by rivers, topography, or politics, they rarely achieve graph-paper perfection. The Playa, on the other hand, has no obstructions of any kind. Starting with an empty desert, the festival is built in about a month, and most returning visitors would be surprised to learn that it’s never in the same place twice. Such are the advantages of Black Rock Desert. Instead of using stodgy Cartesian coordinates, Black Rock City is organized along polar coordinates, making its coordinate system unique among massive fire-themed desert art festivals. 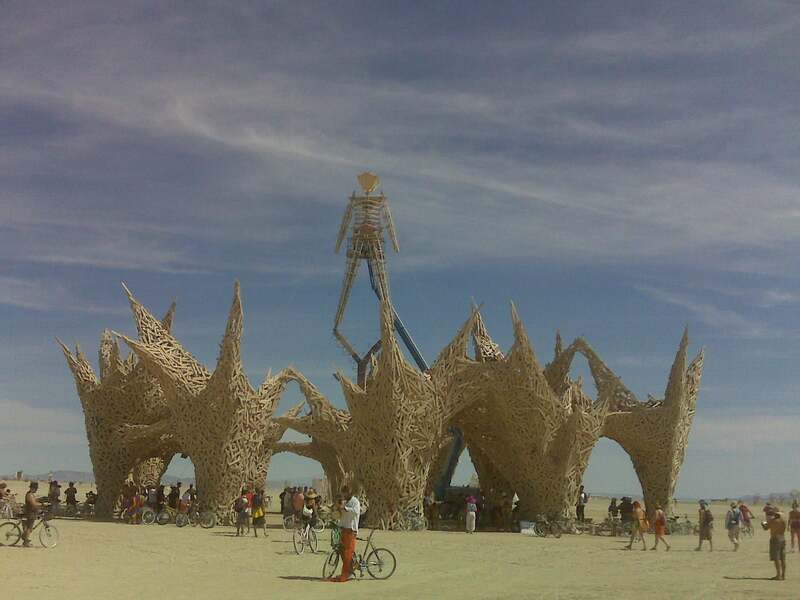 At the mathematical origin is ‘‘the Man,’’ the titular carry-through from Burning Man’s historical origins. The angular coordinate is described using time on a clock face, with the city stretching from 2:00 to 10:00, and radially from R = 0:5 miles to R = 1 mile. The innermost ring of the city is ‘‘Esplanade,’’ with each street as you move radially outward given a name beginning with a sequential letter of the alphabet. For example, in 2017 the names were Esplanade, Awe, Breath, Ceremony, Dance, Eulogy, Fire, Genuflect, Hallowed, Inspirit, Juju, Kundalini, and Lustrate. Radial and angular locations in the city are specified using a letter and a time. For example, you might describe your camp as being at ‘‘D and 7:30’’. The large art installations are harder to pinpoint, since they’re scattered throughout the center of the ring and out into the ‘‘Deep Playa,’’ beyond the 10:00–2:00 gap where there are no street signs. ‘‘Center Camp,’’ where all of the official operations, bureaucracy, and public services are located, is a secondary set of ringed roads located centrally at 6:00. The sudden addition of a new city to the Nevada landscape doesn’t go unnoticed. Although there’s always some grumbling whenever 70,000 people suddenly show up anywhere, capitalism has a way of bringing Burners and the citizens of Reno together. The demographic inside local Wal-Marts shifts precipitously in the days leading up to Burning Man as bikes, water, and food are stripped from the shelves. On the way out, many of the tens of thousands of visitors want a dust-free meal, and all of them want a shower (although some amount of playa dust inevitably makes it onto outbound airplanes). 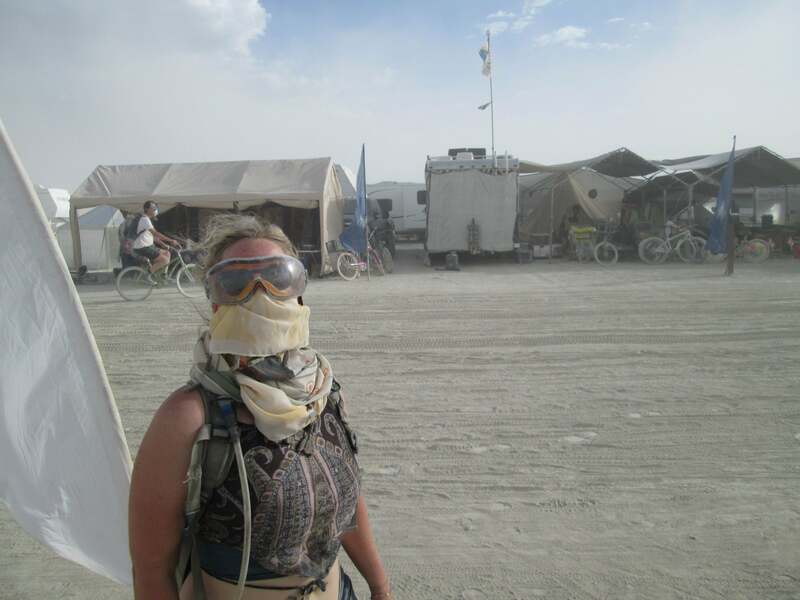 Burning Man has a ‘‘gift economy,’’ so once you’ve left Reno and entered Burning Man proper, money ceases to have worth. In a barter economy you exchange goods for other goods. In a gift economy you give without the expectation of any return. It ‘‘works’’ because everyone else (or at least a larger fraction than you might expect) is doing the same. The gift economy even covers public transportation; if you see a mutant vehicle with enough space for a person, then you can jump on. I wouldn’t trust it to handle the housing market, but it did supply pancakes three days in a row from three different locations. Against this backdrop, my good friend and office-mate, Spencer, and I forded out and set up an ‘‘Ask a Mathematician / Ask a Physicist’’ booth to discuss and hopefully answer whatever questions might come our way. We wanted to keep up our half of the gift economy contract, but giving things away is expensive and it’s difficult to find a productive application for Banach spaces and character classes in the middle of nowhere. Our one big skill is talking about math and science, so that’s exactly what we did. The very first two questions, ‘‘How do I find the love of my life?’’ and ‘‘What is spacetime made of?’’ set the bar for variety and difficulty. With a big enough shoehorn, you can turn anything into math, so we reduced the first question to finding the best of N options, where you only meet the ‘‘options’’ sequentially and can only say yes or no to each. In other words, by ignoring all the nuance of romance we had reduced finding the love of one’s life to the ‘‘fussy suitor problem’’ (more commonly known as the ‘‘secretary problem’’). The optimal solution is to pick a value N, date N / e people (e ≈ 2:718, so this is a little more than a third of the total potential love interests), and then marry the first person you like better than anyone in that first group. But after a few more people joined the discussion, the answer evolved until we eventually settled on this: interact with lots of people, be patient and kind, and what’s wrong with flowers? It may not have a solid mathematical backing, but I bet it works better. ‘‘What is spacetime made of?’’ was actually a lot easier to talk about, but we were surprised by how fast it became philosophical and mathematical. Time and space come up a lot, and we’ve found that the simplest, most solid, and universally disappointing definitions for them are that time is what clocks measure and space is what rulers measure. On that first day, those definitions went over well, but then the conversation swerved into the relationship between the two. Then into how they’re affected by mass and energy. Then into what that says about space and time. There are hand-wavy ways to talk about these things, but no one was satisfied until we had gotten neck deep in spacetime intervals (the spacetime notion of distance, s2 = x2 + y2 + z2 - (ct) 2) and parallel transports (a method for describing the curvature of space), and surrounded the booth with equations and diagrams in the dust. The next year we replaced the dust with a whiteboard, and the year after that (after we learned what playa dust does to whiteboards) with a blackboard. We had initially assumed that public enthusiasm for physics and especially math would be lukewarm. We expected to get a handful of straightforward, easy questions about fractions and outer space, then break for lunch. Instead, we were a lightning rod for fascinating, wide- ranging, precise inquiries. Rather than talking to rare individuals, we found ourselves holding court with a dozen people at a time, fielding multiple new questions even as conversations about previous questions ruminated around the group and resurfaced. After the first year we invested in a bigger tent. For every ‘‘How fast is Earth moving?’’ there was a profound debate into the nature of understanding itself followed by a delving inquiry into quantum theory. I found that detail especially surprising. My own research is in quantum information theory, which I was certain would not come up in a tiny tent in the middle of the desert. But it turns out that the big questions that drove me into my field, about entanglement, Schrödinger’s cat, and the endless train of other bizarre things quantum theory implies about our world, are nothing special. A shocking number of self-identified non-scientists have the same questions, and if you advertise yourself as ‘‘a physicist,’’ you’ll hear them. Although I’ll admit to a certain amount of if-you-have-a- hammer-every-question-is-a-nail-ness, it’s surprising how frequently the double-slit experiment (a beautifully weird keystone experiment in quantum physics) meanders into the conversation. The simplest and often most profound questions tended to come from professional scientists. A researcher from the satellite division at Boeing sparked a heated debate about the relationship between prior probabilities and human bias when he asked, ‘‘Why do weird things happen so much?’’ One innocent question, ‘‘Is there such a thing as a one-half-dimensional space?’’ split the assembled guests into tribes on what ‘‘space’’ meant in this context. On one side were people who thought that ‘‘fractals with dimension one-half’’ was a reasonable way to talk about such a space, and for them, the answer was yes. Another faction believed that ‘‘space’’ clearly means ‘‘a space you could imagine walking around in,’’ and for them the answer was no. More remarkable than the politeness of the debate was how well informed it was and how quickly new arrivals came up to speed. In retrospect, we shouldn’t have been surprised. While all of the art on the Playa is eye-catching, a lot of it is extremely technical as well: lasers that continuously outline your shadow, sensors that sync the Man’s heartbeat with your own, huge kinetic sculptures, interactive digital art (which is either highly random or unobviously complex), and on and on. A moment’s thought would have revealed that there must be an army of scientists and engineers behind the scenes. 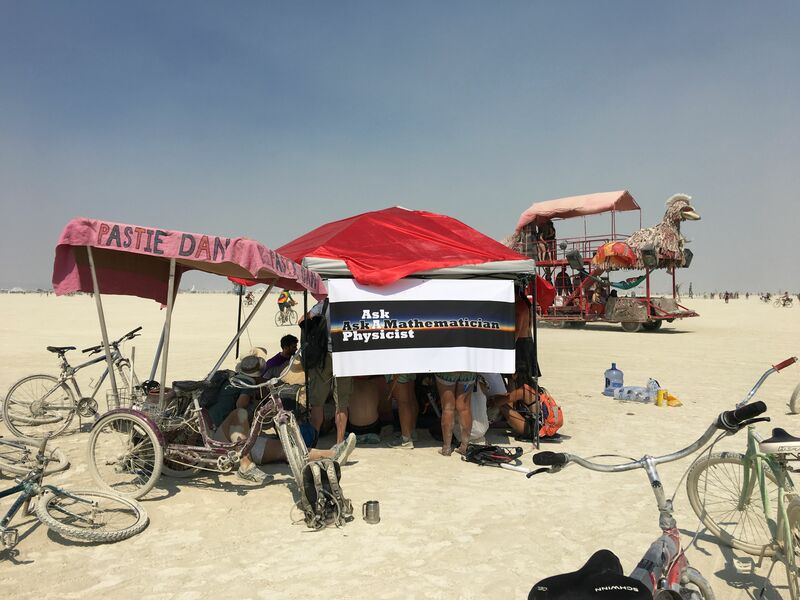 Fortunately for us, through our booth we were rapidly introduced to the healthy math, science, and maker communities of Black Rock City. There’s even a ‘‘Math Camp,’’ built in and around a second-order Sierpinski gasket the size of a truck and located (we were absolutely thrilled to learn) at E and 3:14. There they have guest lecturers, an ‘‘open problems’’ board, and tequila shots. Once you’re aware of the nerdy undercurrent, it’s hard to miss. While walking around in the ‘‘Deep Playa’’ (a long walk from Black Rock City proper) and looking at art, Spencer was struggling to explain the idea behind wiki software to me. The one other person present, a man wearing sunglasses, feathers, and body paint to the strict exclusion of all else, volunteered ‘‘You know, my engi- neering firm uses wiki software all the time!’’ He really cleared up a lot of confusion, but in any other context that would have been an unusual conversation. The people attending Burning Man come from all over the world, with wildly divergent personal histories. So as often as not, the festival itself is the only common experience two strangers may have. Fortunately, that common experience carries a lot with it. 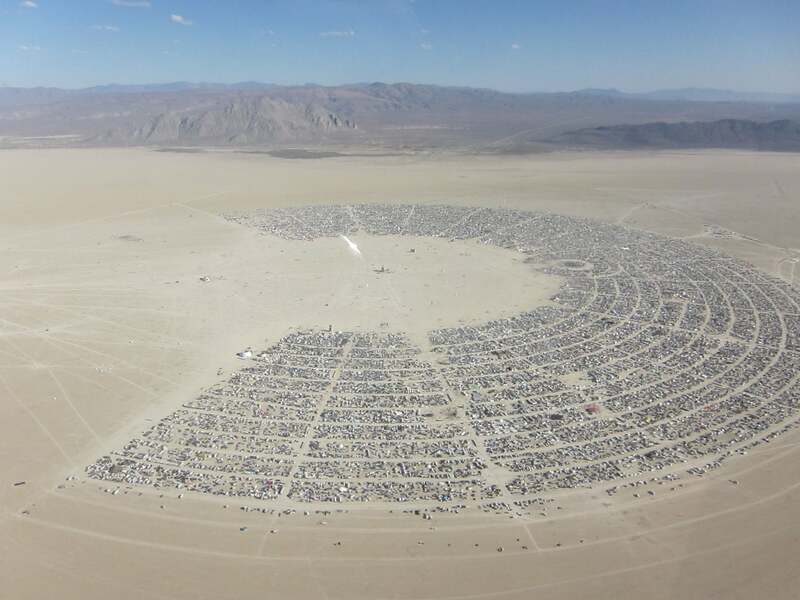 For example, when a question about complex numbers comes up (it always happens at least once), you can get everybody onto the same page by talking about the complex plane in terms of the layout of Black Rock City: the Man is at zero, Center Camp (Esplanade and 6:00) is at i, the main entrance is around - 2i, the 3:00 and 9:00 plazas are at ± 1, and the Temple (a nondenominational, pan-belief, transient, and intentionally flammable structure) is at + i. And when all else fails, there are very few people at Burning Man who aren’t at least a little enthusiastic about open fires. A detailed conversation about momentum and gyroscopic forces is normally difficult to follow, but if there happens to be a helpful fire dancer nearby, suddenly the theoretical becomes empirical and arguably very difficult to ignore. A fire dancer’s weapons of choice are typically poi: flaming weights at the ends of a pair of chains. Changing a poi’s plane of rotation, without that plane intersecting yourself, requires some subtle angular momentum exchange, and fire dancers, while usually not familiar with the exact vocabulary, are always more than happy to demonstrate. Who can’t learn about torque if the option is getting burned (a little)? Most of the people who show up at the booth don’t explicitly have questions to ask. At least not at first. For most people the barrier to even beginning a conversation about science and math is way too high. Of course, everyone has things they wonder about, but as any teacher can tell you, most of us are also worried about sounding stupid. It takes listening for a little while to realize that science is something that can be understood, scientists aren’t unusually smart, and there’s no need to impress them. It warms your heart to listen to what other people wonder about and to hear how they think, and nothing makes a science conversation more inclusive than a sci- entist who’s deeply bothered by exactly the same things that bother you. We were so impressed by the enthusiasm behind the questions, both from the asking itself and the inevitable ‘‘Oh yeah, I’ve always wondered that too!’’ that afflicts practically everyone in earshot, that we set up the booth back in New York a few times as well as online in the form of http://askamathematician.com. We’re still surprised. Ten years on and the questions keep coming. Seth Cottrell earned his PhD in mathematics from the Courant Institute at NYU. His research is in quantum information and he teaches at New York City College of Technology. For ten years, He has talked to complete strangers about math and physics and written about it at askamathematician.com. His new book is "Do Colors Exist? : And Other Profound Physics Questions." Now approaching its fortieth birthday, The Mathematical Intelligencer is a lively quarterly written in an engaging, informal style for a broad audience. It features expository articles about mathematics (broadly defined), about mathematicians (ditto), and about the history and culture of mathematics in its intellectual, social and scientific context. Puzzles, poetry and fiction appear in its pages too.